Keith Olbermann's arrival as the lone commentator at NBC Nightly News is the first overt commentator NBC's hired since PBS omnipresence Bill Moyers in 1995. A quick Nexis search shows Olbermann has been very rarely on NBC News airwaves. 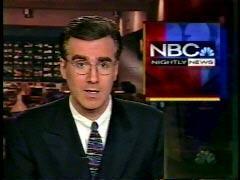 He actually anchored NBC Nightly News as a weekend substitute on April 12, 1998 (Easter Sunday, see accompanying photo) and May 9, 1998. In recent years, he's surfaced a few times on the Today show. He was interviewed to plug his "Worst Person In the World" book last September 15. He reported on major-league shortstop Alex Rodriguez on February 16, 2004, and co-hosted the Saturday edition of Today with Campbell Brown on August 23, 2003. In the commentary and prime-time special clauses of Olbermann's new deal, there are obvious parallels with Moyers. They are two fiercely left-wing commentators who oddly deny a liberal bias when asked by the press. In February 1995 promotional spots NBC promised: "Bold, clear, balanced and fair. Now NBC Nightly News with Tom Brokaw has a new dimension -- Bill Moyers." Moyers began his new duties on February 14, 1995, and NBC had no plans to provide a conservative counter-weight. Just like the odd denials of Steve Capus that it's "really sad and pathetic" to think Olbermann tilts NBC further to the left, in February of 1995, we reported in MediaWatch that the New York Times relayed February 1 that NBC News President Andy Lack dismissed questions about Moyers' liberal bias at PBS, insisting "that perception is inside the beltway, and perhaps inside about ten blocks of New York and ten blocks of L.A. I don't think the American people give a whit about it." The same day the Baltimore Sun quoted Moyers: "I'm not in politics. I have no agenda. I'm not pushing a platform. I have no ideology." Really? In a 1989 Esquire profile Moyers tagged Newt Gingrich as "Joe McCarthy with a southern accent." Here's an example of his Nightly News commentary, from March 7, 1995: "Gingrich uses words as if they were napalm bombs....He sent conservative candidates a long list of words to smear their opponents -- words like 'sick,' 'pathetic,' 'traitors,' 'corrupt,' 'anti-family,' 'disgrace.' With talk radio quoting it all back to us, our political landscape is a toxic dump." As Welch listened to G. Gordon Liddy on his car radio, Moyers charged: "The airwaves are still saturated with militant rhetoric. Day and night you can hear a stream of rage and insult directed with unremitting hostility at government and others. It rubs like salt in deep wounds and some of the families are trying to counter it." Then, as viewers saw several victims being interviewed by KTOK's Carole Arnold, Moyers explained: "Emerging from their private grief, they appeal for an end of hateful talk and political invective. Their experience is their message. What a society sows, it reaps....This local station has given the families a forum, but it also carries several hours of talk every day that they find inflammatory." The station does not carry Liddy, so the broadside against "hate" and "inflammatory" talk goes undefined. Welch proceded to tell Arnold: "Of course I think the media need to be involved a little bit in a little bit of control of the hate radio going on. I'm very disturbed about that. I mean where's the responsibility?" ...Moyers concluded the hour with this seeming indictment of House Speaker Newt Gingrich as co-conspirator: "It will never be the same. The bombers saw to that. The tears and grief, the pain and the sorrow were all intended. Terrorism is the politics of murder. We should have seen it coming. Hate was in the air. Government had been vilified, found guilty and sentenced to die. It didn't matter who was in the way. There are lessons for us here, something to take away from the wreckage of that day, if we're listening, one year later." One more footnote in recent media history: Moyers was also an early contributor on MSNBC, back when they tried the schtick of hitching their network to the Internet. Moyers rotated in as a host of their badly named prime-time interview show "Internight," and lit up with the usual liberal bias.